Over the years, a surprising number of volatile organic compounds (VOCs) have been used as aerosol propellants. Those that are liquids at room temperatures have ranged from n.pentane (-5 psi-g. at 70°F) to carbon dioxide (837 psi-g. at 70°F). 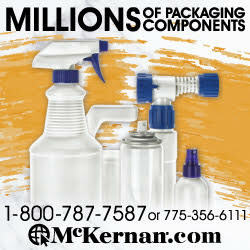 Those such as nitrogen, compressed air (CAIR), oxygen and argon have critical temperatures below -310°F. They cannot be liquefied above that cryogenic temperature, even at pressures up to 50,000 psi-g. Around 1965, the aerosol industry arbitrarily decided that volatile compounds boiling above 105°F would be classified as propellants (methylene chloride boils at 103.57°F). Some exotic propellants have been commercialized in aerosol forms. DuPont’s C-318 (octa-fluorocyclobutane, 25.1 psi-g at 70°F) was once used as a food propellant, always with nitrous oxide. It allowed more product to be used in any given can size. Vinyl chloride (monomer, 34 psi-g. at 70°F) was used around 1960 in paints, hair sprays and shave creams until it was discovered to be a mild animal carcinogen. While no one was harmed, torts were pursued by lawyers for over 30 years. As late as about 1995, non-flammable sulfur hexafluoride (321 psi-g at 70°F) was being used in at least two automotive products. Still later, it was found to have a Global Warming Potential (GWP) of about 25,000, meaning that the escape of one pound into the atmosphere would be the equivalent of injecting 25,000 pounds of carbon dioxide. Ethylene oxide, a flammable sterilant and toxic gas (7.3 psi-g at 70°F) has been packaged in small aerosol containers for use in hospitals and clinics. Similarly, methyl bromide (marginally flammable, 27.9 psi-g at 70°F) has been filled into special Crown cans as a toxic insect fumigant for tomato greenhouses, flour mills and bakeries. 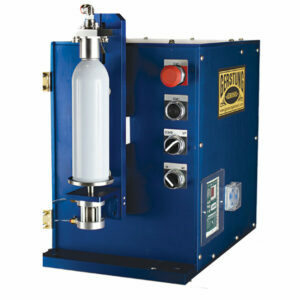 It is arguably the most intensive solvent ever put in an aerosol dispenser. It is poured into the bottomless, inverted can after which the base is attached by double seaming, using a special sealing compound. There is no top opening. To operate the unit, a special valve is attached, puncturing the top of the can. Lastly, in the early 1950s, sulfur dioxide (34.4 psi-g at 70°F) was aerosolized as a refrigerant refill. This was a case which the propellant was also the product. To illustrate the versatility of the aerosol system, laboratory work has shown that perfectly dry solutions of hydrogen chloride (HCl) in petroleum distillates were very effective in removing lime and rust stains from sinks, tubs and toilets, but the odor, toxicity and acidity with water precluded commercialization. Aerosols containing anhydrous ammonia (114 psi-g at 70°F and 317 psi-g at 130°F) were also prepared as a potential coolant additive for early refrigeration systems, but the pressure was excessive. They were never commercialized. The first aerosol propellant to be banned was vinyl chloride monomer (VCM) in about 1960. This was an industry ban, precluding the need for any government intervention. However, the U.S. Environmental Protection Agency (EPA) and U.S. Food & Drug Administration (FDA) did issue regulations banning chlorofluorocarbon (CFC) propellants in April, 1978 after determining that they could diminish the planet’s stratospheric ozone layer. Europe followed some ten years later, and a few countries were still using CFCs as late as about 2010. The ban included CFCs 11, 12, 113 and 114. Later amendments targeted the Halons, as 1301 and 1211, and the HCFCs, as 22, 142b and 133a. Also included were some “low flammability” solvents, such as alkyl bromides and 1,1,1-trichloroethane. Under its Significant New Aerosol Propellant (SNAP) program, the EPA must approve all new propellants developed for aerosol applications. It not only considers Ozone Depletion Potential (ODP), but tropospheric ozone generation (VOC programs) and GWP, as well. It also reviews these criteria for existing propellants. For example, after a round table meeting on Aug. 1, 2014, centering mainly on the GWP of 1350 for HFC-134a, the EPA is now considering which aerosol applications will still be allowed as of 2016. Health and life safety uses will survive; others will be carefully scrutinized. The number of propellants available to the industry is still impressive, and during the last two years the list has been increased by the introduction of propellant, having a carbon-to-carbon double bond. Table One will illustrate those currently available. NOTE: DuPont’s HFO-1234yf has been developed principally as an air-conditioner coolant. HFC-134a uses are extremely limited due to its high GWP (also HFC-227ea). “n/a.” (Not Applicable): Non-liquifiable, since above the critical temperature, or triple point. Solstice PF is 1-Chloro-3,3,3-trifluoroprop-1-ene from Honeywell Fluorine Chemicals. With such a diversity of propellant pressure and solvent abilities, it is apparent that a diversity of gassing machines is currently in use by the aerosol industry. A further distinction relates to production speed, which currently ranges from one-head (laboratory type) models to very complex 18-head models, “boiler-plated” to produce 20 units per head per minute, or 360-per-minute-per-machine. 6 Head Inline TTV Pressure Filler. Photo provided by Gerstung Aerosol, Inc.
From the beginning of the aerosol industry in 1947 to about 1958, at least several fillers used the so-called “cold fill” process for adding propellants to cans. The early Crown and Continental cans were delivered to fillers without attached bottoms, to be filled inverted. The concentrate and propellant (sometimes mixed in large pressure tanks) were chilled to -40° to -45°F (-40° to -43°C) and poured into the cans. The can bottoms were then hermetically double seamed on to the body flanges. Hot water bathing followed. When the industry converted to the nominal “one inch” mounting cup valve in 1953, the pre-chilled contents were poured through the hole, valves were inserted by manual “valve pokers”, the cans were sealed by crimping and then hot water bathed. The “cold fill” process had many shortcomings. The low-odor kerosenes, often used for insecticides and air fresheners, sometimes turned “slushy” at the -40°F temperatures. Water-based products froze and could not be filled. The large HCFC-22 or ammonia based refrigeration system and hot water bath required prodigious amounts of power. Lastly, propellant evaporation, while producing air-free aerosols, was also a significant economic burden. TTV Single Head Gasser Shaker Lab Model. Photo provided by Gerstung Aerosol, Inc.
Fortunately, machines for filling liquid propellants backwards through the valve were developed around 1953 by such firms as Alpha Engineering and Kartridg-Pak. They became known as Through-the-Valve (TTV) gassers. The in-line gassers could be used with up to four heads on a two track, double indexing line, producing as fast as about 80 cans per minute with wide-open valves. The more preferred versions were rotaries, where a standard base machine could be equipped with three, six or nine heads. In operation, the cans would be perfectly placed on platforms and the gassing head would descend so that an adapter would engage the valve stem. A piston would then deliver a fixed volume of liquid propellant into the aerosol can. To properly energize the gasser, the propellant would be delivered at pressure of about 450 to 625 psi-g. This required a special pump to raise the typical pipeline pressure from about 150 psi-g to the desired range. Excessive pressures had to be avoided or they could “dish” depress the flat-bottomed valve mounting cups of those days. A refinement that took a long time before coming into general use was to control the propellant temperature, and thus its density. This could be accomplished with a small heat exchanger. Otherwise, if the propellant slowly warmed up during sunny days, the density would decrease and less weight would be injected into cans. The machine could always be stopped and the cylinder volume re-set, but this would be time consuming. A major problem with these early TTV gassers was the throughput rate of the aerosol valve. This was most serious when attempting to fill a large quantity of propellant through a valve with a small stem or body tailpiece orifice, such as one with a 0.013″ diameter. The gasser would then become the rate-determining operation of the production line, slowing it down and thus reducing the all-important number of filled cans produced per shift. Product development chemists were advised to concentrate on specifying valves with larger orifices, even though they might deliver the product faster than desired. UTC Gassing Station. Photo provided by MBC Aerosol. In these early days, a number of aerosol products utilized carbon dioxide or nitrous oxide. There was even White’s Propellant: a blend of 85% nitrous oxide (“sweet”) and 15% carbon dioxide (“tart”), where the two taste elements cancelled each other out and did not change the sensory properties of natural or synthetic whipped creams. These high pressure propellants were stored in manifolded cylinders or receptacle tanks. Since vapors would be withdrawn, a cooling process, the containers were heated electrically to maintain a pre-set temperature range. At some facilities, cylinders were warmed with hot water. The gas, at pressures of about 130 to 180 psi-g, was then piped to a gasser-shaker machine. Both in-line and (later) rotary designs have been utilized. In the in-line machines, some 10 to 18 cans (depending upon diameter) are led into a long slot, placing each of them under a gassing head. The heads descend, with adapters depressing the valve stems. Then, gas pressure is applied; at the same time, the machine agitates the cans using a pre-set amplitude, frequency and time. Lower injection pressures are needed to add the desired amount of carbon dioxide or nitrous oxide to low viscosity products, such as windshield de-icers and those containing high levels of petroleum distillates. In the case of cookware lubricants, which contain high levels of relatively viscous vegetable oils, higher injection pressures are needed to adequately achieve the desired amount of propellant. Viscosities are often checked, preferentially by determining the Ostwald Coefficient (Zahn Cup Method, et al.). The gassed aerosol cans leave the gasser-shaker with various “over-pressures,” typically of about 10 to 50 psi. Further shaking or just standing overnight will cause a pressure reduction to (or close to) the equilibrium value. A little known fact is that the gas injections will increase the content temperature, typically by about 3° to 6°F, depending on the amount absorbed, the specific heat of the product and other factors. After propellant injection, the cans are normally led directly to the hot water bath, where the pressure is raised still further. The jostling on the conveyor belts and the act of heating both cause some of the “over-pressure” to dwindle. There are reports of injection pressures as high as 260 psi-g. If this much pressure was actually transmitted into an aerosol can, it would at least become distorted and possibly burst. However, the pressure in the can relates to the rate-limiting orifice size of the valve and to the rate of absorption by the product. Because a given valve specification will produce a rather significant range of delivery rates, it follows that gas injection rates will also be variable. As a general rule, higher injection pressures will result in a wider range of aerosol equilibrium pressures than lower ones. The solubility of carbon dioxide and nitrous oxide varies considerably, depending on the solvent. In contrast, the solubility of nitrogen and compressed air (CAIR) is almost negligible. At 70°F and 100 psi-g., 100mL of water will dissolve a mere 0.478 g. of the gas. Solubility data in some solvents is now illustrated. NOTE: Methylal is CH3-O-CH2-O-CH3; a very strong solvent with a sharp odor. Vegetable oils include corn, canola and soybean oils. TTV Gassing Station. Photo provided by MBC Aerosol. In the U.S., most liquid propellants are now filled by either TTV or Under-the-Cup (UTC) gassers. 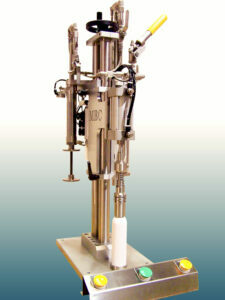 The latter machine is available in one-head, rotary nine head or rotary 18-head models. The rotary machines accurately position the aerosol cans (with valves inserted but not crimped) under a complex head and adapter. 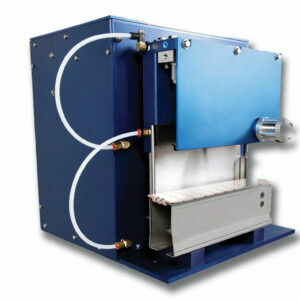 As the machine turns a partial vacuum of about 18 to 22″ Hg. is first drawn. This is optional. Then the valve mounting cup is mechanically lifted slightly and propellant is added. Finally, the cup is pressed down quite forcefully (download pressure) and the hermetic crimp is performed. These operations contrast with those of the TTV gasser, where the can is first either atmospherically or (partial) vacuum crimped on a separate machine, after which it travels to the gasser for propellant injection. 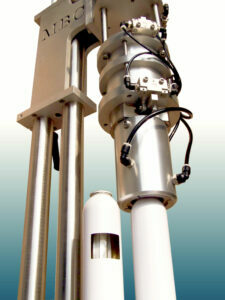 The cost and complexity of the UTC gasser have limited its use in aerosol lines outside the U.S. and Canada. It also leaves a “valve cup full” of liquid propellant when the can is exited. This 3mL or so of propellant instantly evaporates with a unique hissing noise, causing a barely visible cloud of gas to slowly drift downward, where it is captured by the laminar air ventilation system and safely discharged. This may seem insignificant at first, but for a high-speed line producing 100,000 cans per shift, the gas house loss would amount to about 82.2 U.S. gallons. An early advantage of the UTC process is that the propellant is injected around the valve cup, so that the flow rate is not impeded by valve orifice size. To overcome this deficiency for TTV gassers, male valves and adapters were modified so that valves could be gassed both through and around the stem. This by-passed the stem orifice, but left the body tailpiece and any vapor-tap orifices still in play. Nevertheless, it was a significant step forward and probably led to the sale of more TTV gassers. During the 1980s, Summit developed a unique valve called “The Super 90” where the top of the nylon body was crenelated (multi-notched or indented—“crowned”). When under about 600 psi-g. of liquistatic pressure in the gasser, special stem gaskets bend downward into these small channels, allowing the propellant to quickly flow over the temporarily deformed gasket and into the can. This development was copied by other valve suppliers and has effectively removed the last flow rate obstacle to the use of TTV gassers. These comparatively simple machines have low maintenance, can operate with Buttons on Valve (BOV) with small actuators, lose relatively little propellant in the aftermath of gassing and have the ability to be operated in unoccupied (TV monitored) gas houses. For both UTC and TTV gassers, when using dimethylether (DME), the hoses must be metal lined or metal mesh covered to prevent static charge build-ups and the gaskets must be DuPont’s Kalrez for continuous service. The gassing of carbon dioxide at high speeds has posed some challenges. One marketer fills their hydroalcoholic product by first making a solution of about 10% carbon dioxide and 90% ethanol in a pressure-resistant mixing tank. This mixture, with a pressure of about 200 psi-g. at 70°F, is used as the propellant portion. In about 1995, the Kartridg-Pak firm (now R.A Jones & Co.) developed a nine-head oscillating gasser-shaker, capable of dissolving carbon dioxide into unusually viscous liquids and even flowable pastes. Today, however, most high-speed methods include the IIG process. 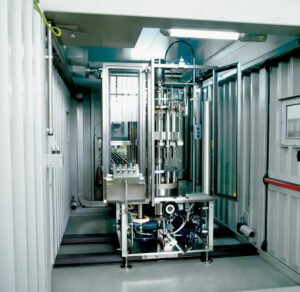 This process, developed in about 1980, initially used a UTC gasser to very rapidly inject carbon dioxide, under pressures of about 460 to 680 psi-g, into low viscosity aerosol concentrates. The gas would then explode the liquid into millions of tiny particles, providing a huge surface area, and thus enabling the concentrate to rapidly adsorb the gas. If all went well the cans would leave the gasser with carbon dioxide pressure only 10 to 15% higher than the final equilibrium pressure, which would be attained after a day or so of aging. Each filler has preferred operational parameters, but some guidelines can be given. There should be at least a 25 to 30% volume headspace for good particulation. The carbon dioxide should be tempered to about 100° to 106°F. The concentrate should be equilibrated to about 60°F. Adapters should be used to permit unimpeded (thus instantaneous) flow of gas into the can. Island depressors may be needed to restrain flat cup valves from flexing upward slightly under unusual conditions, as with tall 211×709 cans of water-based insect sprays. While TTV gassers have been used for IIG, sometimes, with a can shaking machine immediately afterward to reduce non-equilibrium over-pressures, they can be troublesome unless process conditions are ideal. They must be used with the “Super 90” type valve, but even here the rate of gas injection is thought to be slightly slower than that of UTC gassers. If the gas pressure is a bit too low, then the special rubber stem gasket may not depress fully into the body channels, impeding flow rate and causing reduced particulation of the product. Special stem gaskets with slightly reduced Durometers may be more tolerant of lower injection pressures. Island depressors are recommended to prevent the possible slight upward flexing of flat cup valves, but are not needed for conical cup valves.